Video Converter for Mac is a powerful Mac video convertor which can convert video files from one format to another format and convert video to audio for Mac OS X users. This mac video converter supports all video popular formats indcluding flv, MPEG1, MPEG2, MP4, 3GP, 3G2, MOV, AVI, Mpeg TS/TP (for HD Video), etc. Video Converter for Mac can also convert video to audio formats including WAV, OGG, 3GP, Mp3 and M4A,etc.This versatile mac video convertor also provides the function of converting video to audio on mac, audio to audio on mac. The supported audio formats are MP3, M4A, AAC, AC3, APE, OGG, etc. Video Converter for Mac works perfectly for almost all popular video players like iPod touch, iPod classic, iPod nano, iPhone, Apple TV, PSP, PS3, Youtube (web), Creative Zen, iRiver PMP, Archos, various video mobile phones and many other digital video and audio players.Batch conversion is also supported by this powerful video converter. 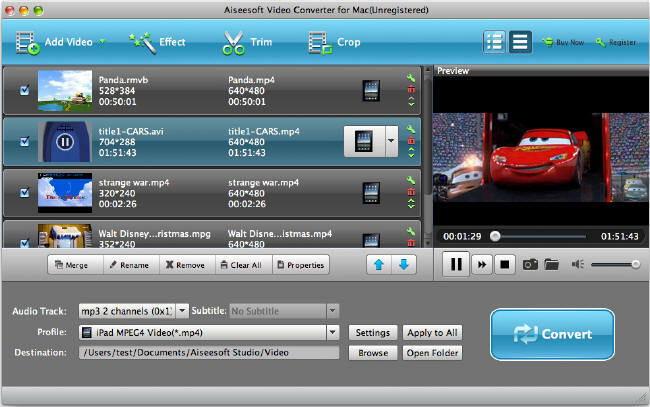 A professional mac video converter developed only for Mac OS (include Mac OS X, 10.5 leopard) users. This mac video converter simple provides settings that almost few clicks to finish the whole conversion. There are several optimized profiles for iPod touch, iPod classic, iPod nano, iPhone, Apple TV, PSP, PS3, Youtube (web), Creative Zen, iRiver PMP, Archos, etc. with different quality in the video converter for Mac which can be used directly without any further settings. If you want iPod 320*240 files in normal quality, what you need to do is choosing "iPod (320*240) MPEG-4 Normal-.mp4" on the output format list. Convert video to audio formats including WAV, OGG, 3GP, Mp3 and M4A. This mac video converter helps you crop video to remove black video sides. Set video output settings including resolution, frame rate, encoder, bit rate, and set audio output settings including sample rate, channel, encoder and bit rate. You can trim your video files to only convert a part of a video file with Video Converter for Mac. Using this mac video converter for mac, you can capture images by clicking the snapshot button while previewing the movie. Set movie video brightness, contrast, saturation, and choose to apply special video effects to your video files. Merge all added files and output one file. The easiest Mac video converter to your videos to all sorts of different video formats with only a few intuitive steps. You can preview video files before conversion to adjust the output quality. Why Choose Mac Video Converter?